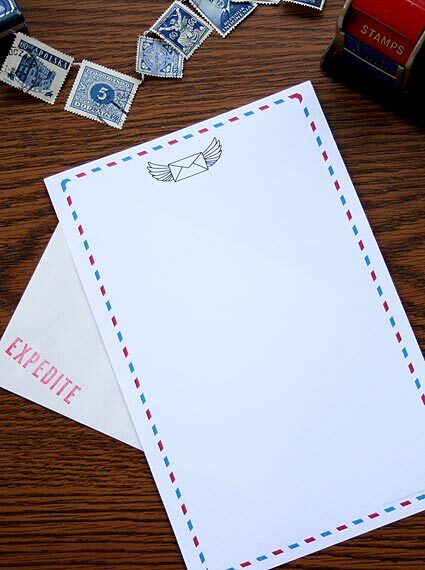 Airmail stationery from The Letter Writers Alliance. I can’t remember the last time I wrote a letter. Or got a letter. A real, handwritten letter. That lost art of letter writing is calling to me. About a year ago, my friend Bri wrote a blog post about these cool letter writing kits she gave as Christmas gifts. She also mentioned an organization called The Letter Writers Alliance, which encourages people to write letters. They even have an actual plastic pigeon that you can stuff with a letter, affix with stamps, and actually mail! Brilliance! Over the past year I’ve thought several times about Bri’s post, accompanied with the thought, I should really start writing letters again. But I haven’t, seeing as it’s much easier to shoot off an email or text to someone. This week, I read The Guernsey Literary and Potato Peel Pie Society, a novel written almost entirely in letters. The book was about writer who began corresponding with a group of people from the island of Guernsey (in the English Channel) about how the island was occupied by Germans during the war. I enjoyed this book on so many levels. I enjoyed reading about a writer – both her successes and her struggles. I also was delighted that her relationship with the Guernsey Literary Society began when one of its members wrote to her about a book. The beauty of the book, though, lies in the strong bond formed by the people of the Society while they were occupied. Though they suffered mistreatment, hunger, imprisonment and some of them – death, they created a family of sorts, watching out for one another and taking care of each other. The book also brought me back to that pang, that desire to write a letter – and maybe to receive one. So, thinking of my one word for this year – PRESENT – I have decided I’m going to write one letter a week for 2013. Handwrite. An old-fashioned letter. I’ll think of it as a way to be truly present in my love for my friends and family – an intentional and thoughtful way to connect with loved ones. I may have even talked my daughter Madeleine into doing it with me! Sundays seem like a great letter-writing day, don’t you think? So this week I’ll purchase some stationery and get ready. I may even join The Letter Writers Alliance. If YOU’D like a letter, let me know in the comments, and I’ll email you to get your snail mail address. Also . . . anyone up for joining me? sometimes I wonder how people would know about a passionate romance between two people if love letters are sent via e-mail? You can write to me!!! Great! I will email you for your address. I actually thought about writing hand-written letters to my children, especially my oldest daughter (10 yrs old), since I don’t see them so often (although, thankfully, this is changing). But so far, I’m more leaning towards video, since then they can not only get the words, but the tone of voice also, and I can show them things much faster than trying to write them down (the “picture worth a thousand words” fits here). But I agree, there is something special to a hand-written letter. This is, after all, the way God has mostly decided to communicate with us, so it is a bit hard to fault! A video “letter” – message, diary – whatever you call it now – is a good idea, too! Great! We will get a letter out to you soon.